I'm just going to be totally straight out with this. The rumors are flying that I'm getting out of birds. I'm not. I'm likely going to cut way way back and may get pretty close to out, but I love the birds and the people too much to let it go completely. There are a couple of reasons why I am doing this, I just don't feel like getting into all that right now. I am not sure yet what I'm going to do, there are several options. I need to do a little "chicken inventory" and give it a lot of thought. I don't take this decision lightly. I left here at 4:45am Saturday morning, and if you know me at all you know that's really not prime time for me, as the ultimate non morning person. I'd actually gone to bed shortly after 8pm on Friday but that was pointless, I tossed and turned til after 11 anyway. Sigh. I must say traffic is very light at that time of day. I'd been concerned about fog but other than a few light patches the night was clear and VERY cold, and it was beautiful to watch the moon sink down over the mountains as the sky started to glow in the east. I wasn't too perky on Saturday. I took 13 birds (5 colors). I don't have anything in super condition right now and did not expect to do much damage. And indeed I didn't. I was very much beaten! 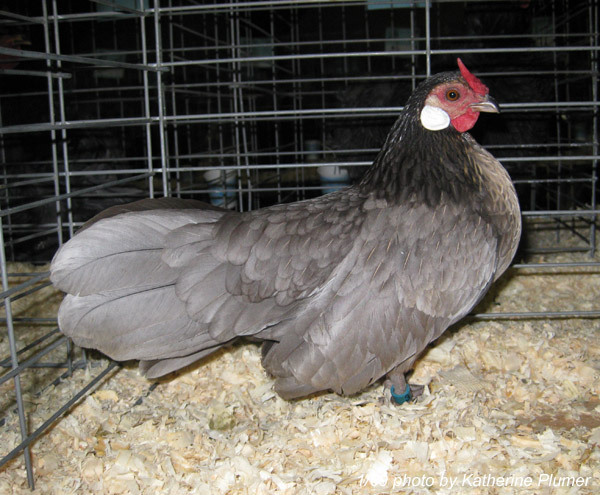 That's okay, I had some tough competition there with very nice well conditioned birds. It was a fun weekend anyway, winning really isn't everything. It's nice to win, but I'm not one of "those" people who can't handle it if I don't (you chicken people know who I'm referring to). ;-) I had a great dinner and conversation with DW that evening, and was able to hit the road and head home pretty early this morning. Oh, I do have to complain about the hotel. Because I like to complain. This is the third or fourth year I've stayed there and I've always been quite impressed and felt it's one of the nicest places I've ever stayed. This year they completely failed to impress me. When I checked into my room it REEKED of ant spray. Okay, I'm pretty easy going, ants happen, I get it. But when I found dead ants all over the bathroom, in the bathtub, and piled up (seriously, piles of dead ants) along the walls that was a little much for me to take. I went and asked for another room. The next one also smelled of ant spray but at least didn't have any carcasses so I just opened the window and by the time I went back in the evening it was fine. But I hadn't really noticed til later that the bathroom countertop had streaks of what looked like soap scum all over it, and when I pulled back the covers on the bed ewww! Seriously, if the sheets are that disgustingly stained, throw then away! Good thing this room had two beds, the second one was much less offensive. But the heater rattled so loud there was no way I could sleep through it, so I had to turn it off. I woke up shortly after 4am so cold that all my joints hurt. I grabbed the two extra blankets out of the closet and threw those on the bed and managed to fall asleep again til my alarm clock went off at 7. Another sleepy day. There was a 2-hour nap with my name on it when I got home. So as much as I'm not too good at "roughing it" I kinda hate hotels too. 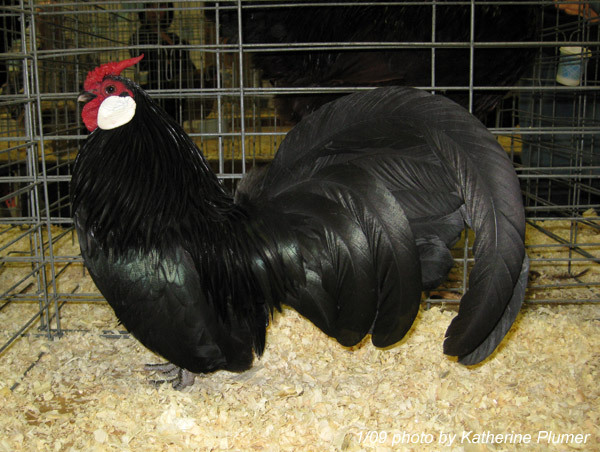 Black cockerel, I really like this guy and thought he might do well. He didn't. 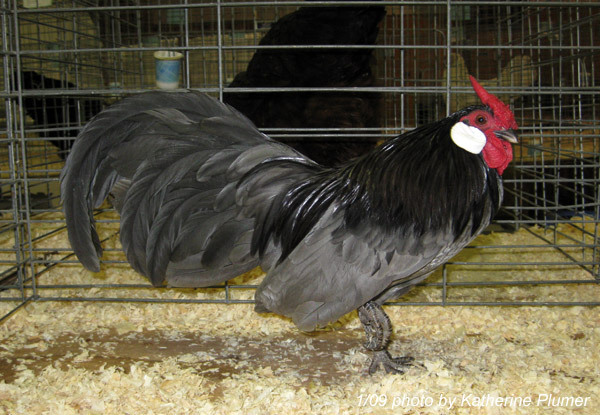 Blue cockerel (out of the Blue Brassy breeding pen). 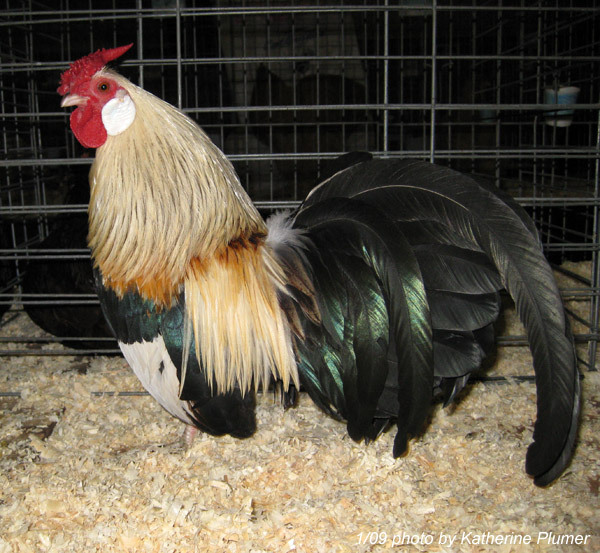 The Blue Brassy is beautiful, I love the coloring. Thanks for the picture!